Traditionally, D&D-type role playing games are played with miniature figures to represent characters and npc’s on the battlefield. But when the kids were small and we started playing Star Wars RPG I didn’t have the proper figures. So. 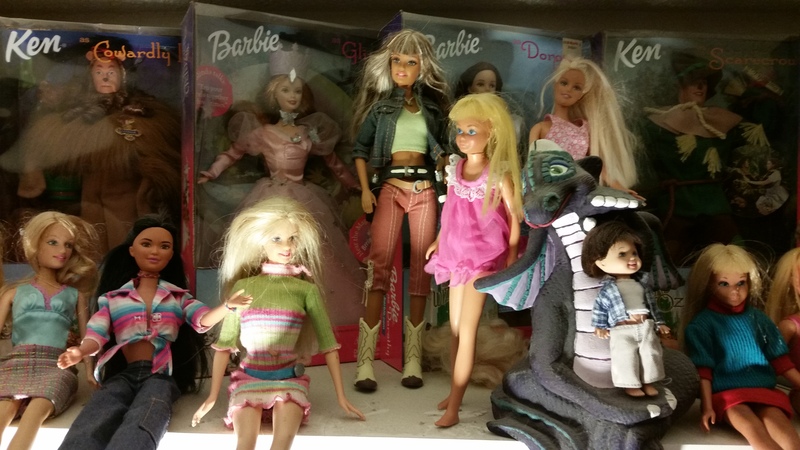 to visualize characters, we used what I did have plenty of, dolls… err, action figures. I told you who the player characters were a couple of Saturdays ago, but let me remind you. Princess Moreno, represented by the Barbie dressed in Emperor Palpatine’s robe was the leader of the adventuring group, and the player character of my niece, who was available back then because they lived in the Dallas area too. Juba Jubajai, Jedi Guardian, was the muscle-brained power of the group. He was my oldest son’s player character. The sidekicks and NPC’s that rounded out the group were Hrowwuhrr, the Princess’s loyal Wookie companion, and Keebo Kloohorn, the Rodian minstrel, quick of wit and poor at shooting. Of course, there were numerous other people you run into in an adventure, like Jedi-trainer Master Link Conn (played by an Abraham Lincoln Presidential action figure) and Barrabas the space pirate. I customized some. Luke Skywalker and Han Solo played a lot of them. And others were only present in our imaginations. For a brief little while, it was a quaint and happy gaming experience to play Star Wars with dolls and dice. At their heart most of my stories, including role-playing game stories, are about being a teacher. In the Star Wars role-playing game, that manifested itself in the Master/Padawan relationship. According to the rules, a Jedi character becomes a Master at experience level ten. For Number One Son’s Jedi character, Juba Jubajai, that happened in the middle of a deep space adventure. At the time the adventuring group was traveling in space in an interstellar tug boat, in trouble with both the enemies of the Republic, and the Republic itself for their actions on the planet Naboo. While traveling incognito in deep space, they came across a battle-damaged ship that was mostly wreckage and had no life signs. But as they investigated the ship, they found two children frozen in carbonite and still alive, even though the ship had been destroyed thirty years before. The children were Trad and Verina Paddox, heirs of a noble house in Tapani Sector that had been reported assassinated years ago as aggressive House Mecetti had forced their noble family to give up most of their planetary holdings and killed their parents. Tracking down folks that it would be safe to return these children to was next to impossible. They ran into folks from House Mecetti with a shadowy agenda that probably included erasing the two children from history and existence. Wraith was a scarred and ferocious agent for House Mecetti that seemed intent on finding out everything he could about the children. He had several run-ins with the adventurers and shots were fired. At one point he was seriously wounded by the Wookie. But he didn’t give up, and was apparently impossible to kill. He naturally became Nevermind, or the Nevermind Jedi. They began treating him like a jolly old uncle. It was assumed that he would train Verina as a Padawan and take charge of the children. Fortunately, more than one character turned out to be the opposite of what he seemed to be. Wraith returned from the dead to reveal that Nevermind was a dark Jedi with Sith ambitions. He was working for Darth Sidious and the evil parts of House Mecetti, and intended to kill the children. Wraith not only revealed the plot, but helped Jubajai to drive the dark Jedi off. So Master Jubajai began teaching Padawan Verina Paddox. The player characters adopted the children and began to fight to reclaim the children’s birthright, leadership of House Paddox and possession of the planet Pelagia. It is satisfying to tell stories where the teachers are the heroes. But, of course, role-playing games are on-going stories, and there is always more to tell. After getting married in 1995, there was a long break from the playing of role-playing games. I had to wait for Number One Son to reach an age where he understood enough about things to enjoy a game where telling a story together was the main thing. He was aware of Star Wars through the fourth movie, The Phantom Menace, which we saw together in the Austin area where Grandma and Grandpa Beyer lived. Then, after the next movie came out, The Attack of the Clones, a role-playing game from the 80’s was updated and I bought the rule books in local game shops. Number One Son and Closest Cousin began playing with me whenever we had the opportunity. We even played during our tent-camping trip to Niagara Falls. Closest Cousin was basically a young girl in her Disney Princess phase when we started playing. So she chose to be a noble. She wanted a Princess Leia-type character, and she created Princess Moreno D’ark to fulfill that need. Number One Son wanted a more action-oriented character, one who could solve problems by whacking them with a light saber. So he created Juba Jubajai, a gung-ho space marine sort of Jedi guardian. We chose to play in the Clone Wars era because that was where I had the most resources in book form and related most closely to the movies they had recently seen and loved. I had a bunch of other old 80’s Star Wars game supplements that I could adapt to fit into the game universe we were using. Of course, two people is a little short of a full adventuring party, so we recruited some good NPC’s to fill in. We had to have a Wookie. So Hrowwuher became Princess Moreno’s devoted sidekick. He could blow stuff up whenever the Princess’s negotiating and problem-solving skills failed to keep the group out of trouble. Keebo Kloohorn was a musician and often supplied the sneakily supplied game-master’s hints to keep the adventure on track. He was also sometimes the character used by Number Two Son, but at a mere five years old, the game rarely held his attention long enough for him to really be playing. On upcoming Saturdays, I will recount a few of our memorable adventures in the Star Wars game realm. But this is only the beginning of the Star Wars crap that I have to share when blogging about collectibles. These are the Luke, Han, and Leia dolls that I have collected over time My Kenner Luke and Leia are not pictured here. Being the oldest 12-inch dolls in my collection, from 1978, they don’t look quite as good as the rest despite my repairs and rehabilitations. So I actually have five Lukes, two Hans, and four Leias. I threw in R2D2 because he and slave girl Leia were a set. It is my intention to show you this soul-crushing collection bit by bit because it can be daunting otherwise. Stay tuned for further episodes… or be on the look out if you really desire to avoid them. I do realize that old men who play with dolls are a little off and likely have toxic cooties. I am almost sixty years old. My parents are still alive and both in their eighties. So today I spent some of the money in my Christmas gift from Mom and Dad on a toy. 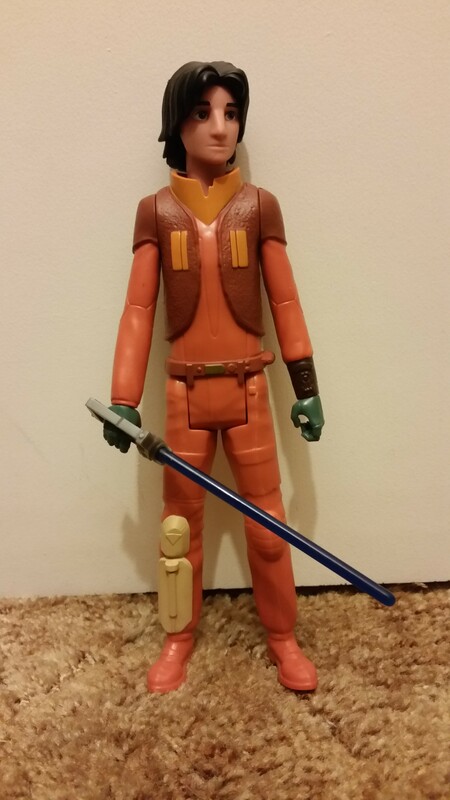 I bought an action figure (don’t call it a doll even though it is) of Ezra Bridger, a Jedi Padawan from Disney’s “Star Wars Rebels”. Now, you may have been told (especially if you are from my generation) that big boys don’t play with toys… but that is total hogwash, propagated by people who are intent on sucking all the joy out of life… but not wives. No, I never said wives. If you haven’t followed this particular line of idiocy in my goofy little blog, I confess to being a doll collector. I collect twelve-inch action figures and dolls. My wife helps me with the Barbie collection. I have Star Wars figures, Captain Action figures, movie figures, monster figures, super hero figures, and so on and so on into a twelve-inch infinity. I will be showing you more of the insanity of my collection in upcoming posts so that you can marvel at a man who plays with toys on into his second childhood.